Note: 5 watertight bulkheads; double bottom ballast tanks; iron hull with wooden superstructure; sister to LEHIGH. 2 double steeple compound engines, 17 & 40" cylinders, 42 stroke; 750hp @ 76rpm, King Iron Works, Buffalo, NY. (1880) 2 8'7" x 16' firebox boilers, 105# pressure, Farrar & Treft Boiler Works, Buffalo, NY. 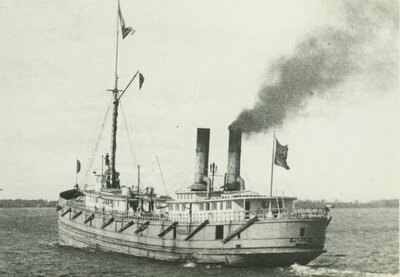 1898 Ashore in fog, South Manitow Island; freed by wrecker FAVORITE. 1905 Rebuilt 263.2 x 36 x 15.4, 1,829 gross/1,669 net tons. 1912, Mar Owned Port Huron & Duluth Steamship Co.; renamed LAKEPORT. 1917, Apr 7 Owned Northwestern Transportation Co., Port Huron. 1919 Rebuilt & shortened 240 x 36.4 x 18', 1,294 gross/643 net tons. Owned Minesota Loan & Trust Co., Peterson & Collinge. Single deck, 5 hatches, 2400 ton capacity. 1930 Owned Buffalo Gravel Corporation, Buffalo, NY.